You may find that interacting with your laptop is troublesome if you have vision impairments. You have a few options to help you interact with your PC. You can change the cursor and make your touch visible. You may find these changes helpful. Having trouble finding the mouse cursor on your screen? You might want to enlarge it or change its shape. 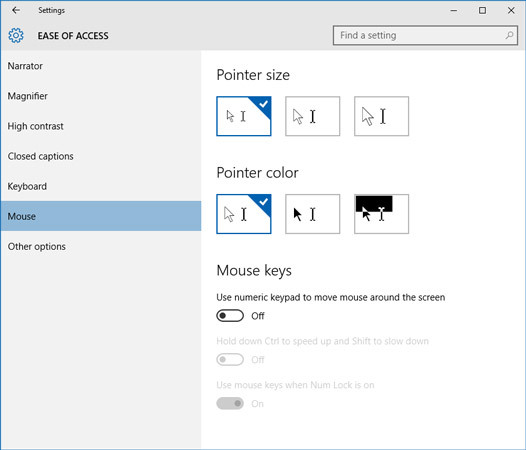 Open the Start menu, click Settings → Ease of Access → Mouse. In the resulting dialog box, click one of the Pointer Size icons to set the size of the cursor. The size of the cursor changes. Click one of the Pointer Color icons to set the cursor color. The cursor changes immediately. Click the Close button to close the Mouse dialog box. Are you having trouble touching the correct check box on your touch-screen monitor? 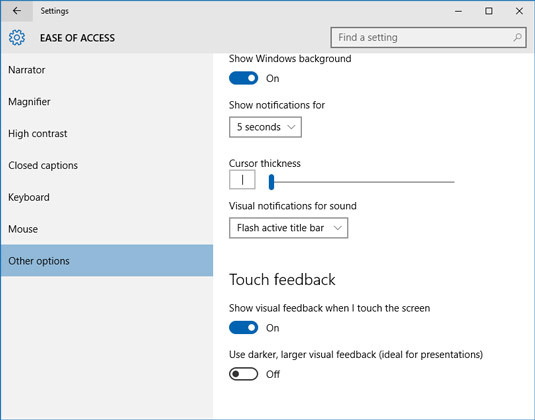 You can enable a visual feedback feature that shows where you touched the screen. Open the Start menu, click Settings, click Ease of Access, and then click Other Options in the left pane. In the resulting dialog box, click the Show Visual Feedback When I Touch the Screen toggle switch to On. The Touch Feedback feature is turned on. To make the visual feedback darker and larger so you more easily spot it, click the Use Darker, Larger Visual Feedback toggle switch to On.